Part baker. Part crafter. Part artist. These are my adventures. Free time, what is that? I’ve been home from school for about a week now. As any seasoned college student would know, summer break is a time to do the things you want and (finally) catch up on that sleep you’ve been depriving yourself of all semester. For me, this means that in my waking hours I’ve been spending a lot of time on Pinterest, pinning everything from new crockpot and cocktail recipes to summer outfit ideas to motivational quotes and inspiring projects. Something that has quickly become apparent from all this pinning is that mason jars are in, whether it’s for wedding favors, summer drink glasses or easy DIY gifts. I combined this love of mason jars with some nostalgia of elementary school crafting techniques and a summer at art camp into my first project: mason jar candle holders. The process is simple enough. I put down newspaper so that I wouldn’t get any of the Mod Podge on the table and wouldn’t have scraps of tissue paper lying around. 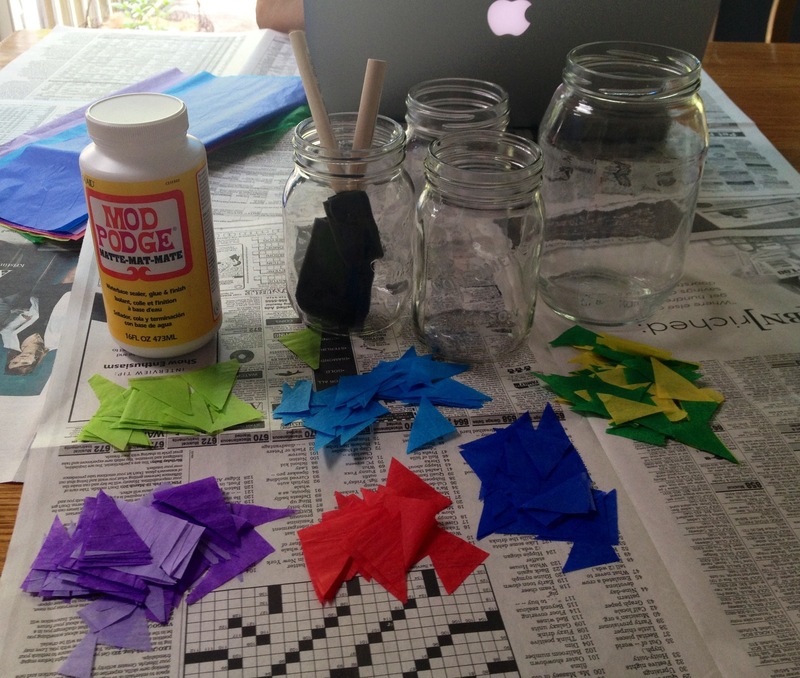 You’ll notice that the tissue paper is cut into triangles. 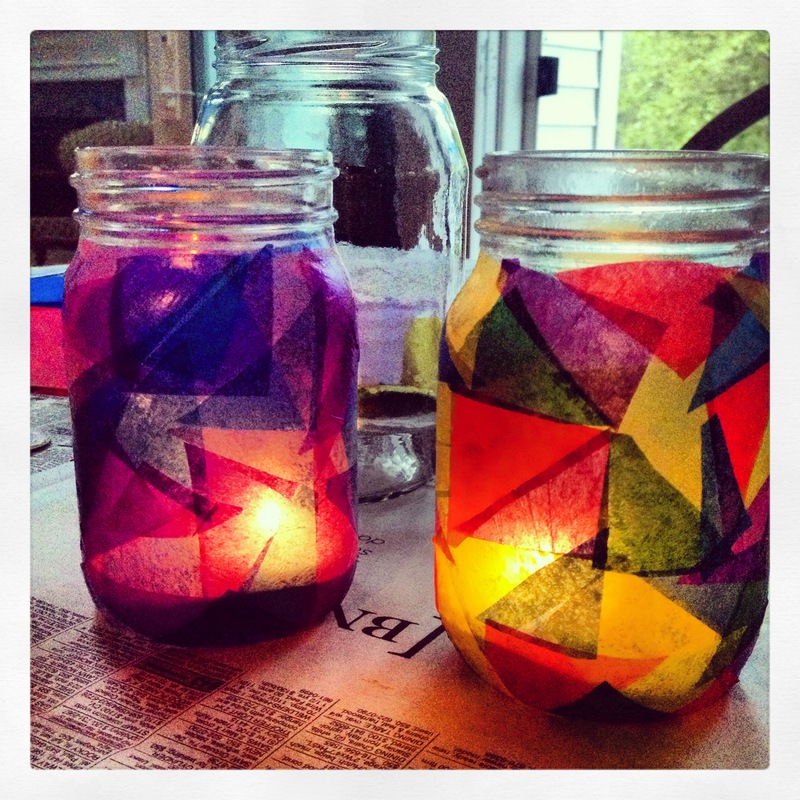 As I was only using three jars, I cut one folded section off of each sheet of tissue paper was I was using. I then cut each long rectangle into strips of rectangles parallel to the short side of the paper and about an inch wide. I then cut those smaller rectangular strips into squares and cut those squares diagonally to make triangles. Arranging the colors was the best part. I suppose I picked this project because I really like playing with colors and coming up with all sorts of combinations. For my first jar, I just used purples and blues to complement some of the colors in our house. 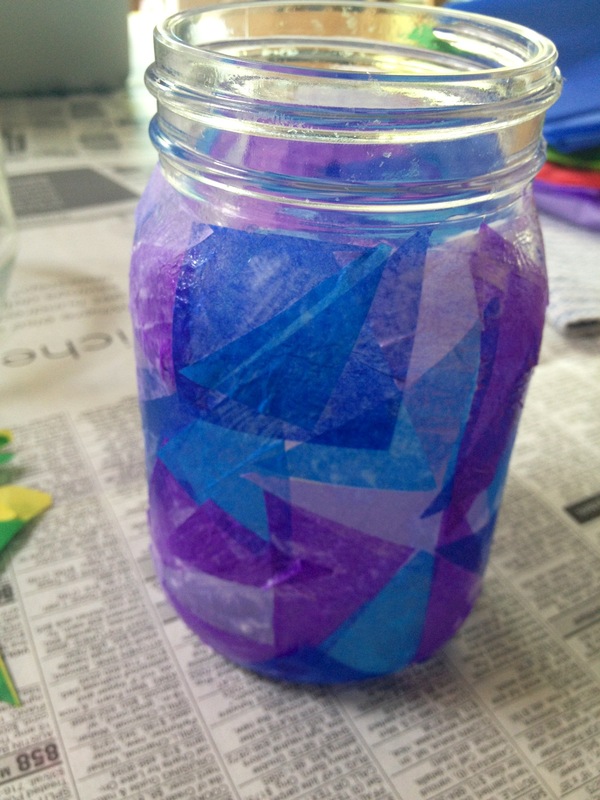 For the other jars, I used a larger spectrum of colors to be more playful and summer-y. 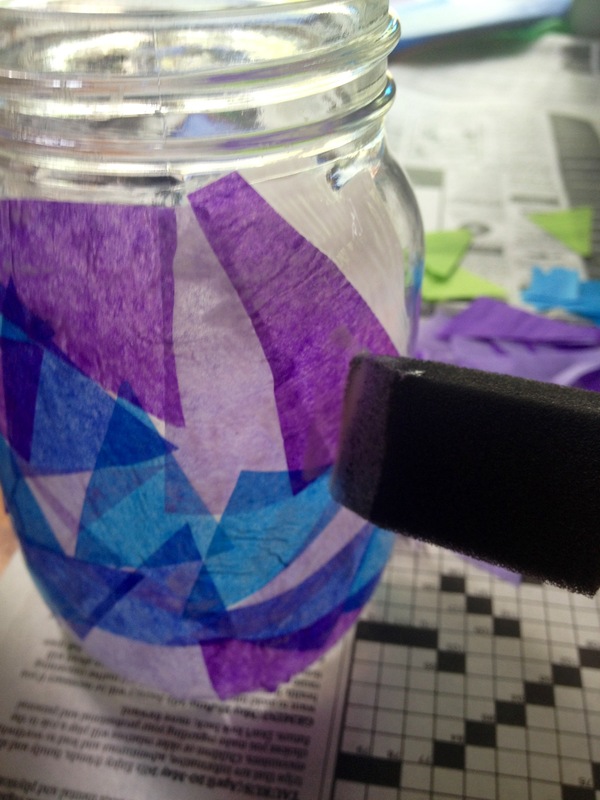 Once I picked colors for the jars, I started by coating a small section of the outside of the jar with Mod Podge. I then stuck a few strips of tissue paper in all arrangements over the coated spot and applied another fine layer of Mod Podge over the strips to flatten them and to make sure they stuck. I repeated this process all the way around the jar, making sure to apply extra Mod Podge as some corners refused to lie flat. I repeated the process for the other jars that I had dedicated to the project. I picked triangles because that’s what I had seen done for similar crafts, but I’m sure that circles or squares would work just as well. In the evening, I put tea lights in the jars and lit them up. They had a really pretty glow to them…hopefully I can make a few more for late nights on the patio and or pretty decorations for my apartment! This entry was posted in Uncategorized and tagged candles, crafts, creative, decorations, DIY, mason jars, outdoor, summer on May 22, 2013 by getcreativeandmakethings.